Enjoy - Food & Travel: Copenhagen - again!!! April 23rd I was off to Copenhagen, again. This was serious stuff, though, as it was a seminar on security, arranged by the Norwegian Society of Security and Safety. In short, this was a business trip for my part, but we were given 8 hours off in Copenhagen, to enjoy the city. We travelled on the M/F Pearl of Scandinavia, the sister ship of the M/F Crown of Scandinavia. 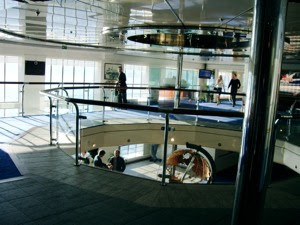 Both ferries to and from the Danish capital are large floating hotels with a conference centre, restaurants, several bars, night clubs, swimming pool, and shops. I will rate the hotel experience on board the M/F Pearl of Scandinavia, as well as share some culinary memories from two of its gourmet restaurants, the Blue Riband and 7 seas. And I will show you a few more sights worth visiting in the Danish Capital.